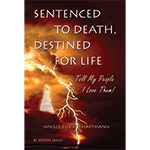 Sentenced To Death, Destined For Life  - $19.95 : Beneficial Zone, Everything is permissible, not everything is beneficial! One Woman's Journey From Certain Death To Abundant Life! - The impossible and yet miraculous journey of one woman living in our generation that is destined to change the hearts of everyone it touches. Every once in a while, a story comes along that is too awesome to believe, yet too well documented by so many witnesses to disprove. A story of the miraculous that shatters the voice of the unbelieving and one that compels the reader to go beyond their own opinions and beliefs and dare to enter the realm of life changing miracles! Into the depths of the grave, destiny reaches out. Through all of the trauma, a twisted understanding of gender, depression, mental illness, multiple suicide attempts, and a prognosis of certain death, a voice is heard from heaven. After all have given up hope, the Creator Himself reaches down from His dwelling place and does the thing He does best, Restoration! Her story has touched many lives already and has inspired them to reach higher and to believe in miracles. Even those who didn't believe in miracles could not deny what they have seen. He has proven His word again, for nothing is impossible for God. He still heals, saves, restores and delivers today!